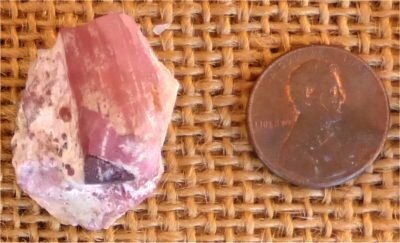 Light Pink Tourmaline (Elbaite) helps us with our creativity and for creating new things without losing your connection to All That Is. This crystal works on the Heart Chakra and the Crown Chakra, connecting you strongly to pure love in a spiritiual sense (love of All That Is). Also working through the Heart Chakra, it brings you joy of life and peace as you walk down your spiritual pathway, especially during the times of change that come with walking this pathway helping you work towards the ultimate goal of enlightenment. This crystal encourages the heart to be all it can be in a high spiritual sense--bringing you faith and trust, awareness of All That Is, joy, and to being to know what true unconditional love is. This crystal is invaluable for awakening the heart to its true purpose.